they had more time to do it. Emily and I took off both Fridays so that we could spend as much time with them as possible. downtown and then headed to the Japanese Gardens in the hills above Portland to the West. I’d never ridden the commuter rail around so much and I have to say that I was very impressed. The Japenese Gardens and International Rose test garden were really spectacular. The Japanese Gardens were constructed so that water ran throughout the grounds into pools and down small waterfalls. There were very cool ancient water structures that move with water to scare away animals from the garden and there were more species of plants than I could imagine. We left the Gardens and headed back to the hotel to grab the car and go for a great drive down the Columbia Gorge Historic Highway stopping at Chanticleer Point and Crown Point for wonderful views down the Gorge. I explained to her parents about the Missoula floods and how they created the very fertile wine valley that Emily and I live. I think her father was really impressed by the views and both her parents were very impressed by the beautiful waterfalls of the Gorge including the 2nd tallest in the U.S., Multnomah Falls. of the car and it got even worse when we had to back track down the roads to finally get to the Highway towards Mt. Hood. It would have actually been far faster if we had headed towards Hood River and headed up Mt. Hood from there... oh well... As it was we made it to Timberline Lodge about 45 minutes after sunset so we couldn’t see anything too clearly although we could see the snow cats working high up on the Palmer glacier with their lights on. We headed into the historic lodge for dinner and drinks which consisted of some soup, sandwiches and snacks at the bar inside which were great nonetheless. It was a long drive back to Portland late at night and all of us were very tired. On Saturday we woke up with a great buffet breakfast at the hotel which included smoked salmon! We then headed downtown to the Saturday Market to walk around. I think this was Mr. Riggott’s worst part of the trip but Mrs. Riggott seemed to love it (there were a lot of hippies there and I don’t think I’ve ever seen that much tie-dye in my entire life). It was a very crowded scene and I was happily surprised to see that her father reacts the same way I do in busy crowds... to get out of them as fast as possible. He and and walked ahead of the ladies and stayed in open areas waiting patiently for the two of them to check out all the hand-made crafts. There were a few musicians who were talented enough to catch our ears and cause us to pause for a listen but otherwise most of the Saturday Market I could pass on. There were a few cool crafts that we saw and I was thoroughly interested in one small tent that was selling exotic carnivorous plants that could be raised in Oregon outside year round. I even got to see a venous fly trap go after a fly in real life for the first time. Emily and her mom both picked up a cool glass-blown hanging flower vase from a very nice woman. dad was simply blown away at the destruction from the event nearly 30 years ago. We snapped a bunch of photos and then headed back to Portland for a night of drinking at Kells Irish Pub. into the gig when they started playing some well known tunes. At 10pm everyone was greeted by a traditional Irish bagpipes and drums that came in from outside, played several loud, boisterous tunes near the stage then left out the front door on a double-decker bus! Her father had a really great time and even picked up a t-shirt from the place. Later I was surprised to find out that a Kells used to exist in Corvallis.... where the hell did it go and why did it leave!!! best part of the Trail of Ten Falls... unfortunately we didn’t notice the sign that said we had to also have a day pass to park there resulting in us finding a ticket when we got back (but Emily and I took care of that we weren’t charged in the long run). There definitely wasn’t as much water due to the long dry summer as there is in the spring time but I think her parents both really liked the hike. Emily’s father had a bum foot for the trip but was able to make the whole hike without any issues. Her mom got her exercise but definitely enjoyed the hike as well. We got to see about 6-7 of the major falls of the park on our short hike of about 3-4 miles. Both her parents thought the temperate rainforest setting was spectacular and her father was amazed at the size of the old growth Doug Fir of the area that reached upwards of 250 feet into the sky. When we got back to Corvallis we had a relaxing night at our apartment after a busy weekend. Monday her parents spent the day checking out Corvallis and walking around downtown while Emily and I went to work and school respectively. unpopulated the beaches were with houses but agreed that it definitely lacked the very cool historic feel of the East Coast fishing villages. From there her parents headed down the coast towards the Redwoods and then towards Crater Lake where we would meet them on Friday morning. edge of the cliffs and her father got a kick out of the fact that there were absolutely no guard rails for the public you would normally find in the east in similarly dangerous places. We all got some great photos of the lake before it started to sprinkle out a little. We even saw a deer sprint across the road and appear to nose-dive off a cliff on the other side! I took Emily to the same cliff that Chris and Aaron and I went to two months prior over Cloudcap Bay... which made her mom nervous. I still can’t get over the sheer vertical drop of that cliff.... over ~1500 feet of vertical straight down to the lake! After Crater Lake I decided we should take the scenic drive around the Cascade Lakes for her father to check out the amazing fishing right off the road there. We didn’t venture into any of the lakes due to time but when we finally stopped at one just before Mt. Bachelor I could tell her dad was super excited to possible come back and do some fly fishing in the area. We drove by lava flows and through extensive wild fire burned areas before arriving at Dutchman Flats for some photos towards Mt. Bachelor and towards Broken Top and the Sisters. We stopped for dinner at the Cascade Lakes Brewing Company where we were able to catch a Patriots Pre-season game and have some oyster shooters with Pepper Vodka! After searching in vain for a hotel for about 20 minutes (There was a Ween Concert in town... really... is Ween still that big?) we found some rooms at the Sugarloaf Mountain Motel for just $75 each, great price for pricey Bend, OR! the future. We found one artist that works in the ski shop at SkiBowl during the winter and produces Bronze Art in his spare time. He had several bronze pieces of skiers coming slopes and his bronze world being stitched together by a man sitting on it is owned by both President Obama and Senator McCain. Ahhh.. if only I had money to buy the skier one, which he said I could personalize as well. Her dad and I also checked out REI and Orvis together where he told me a lot about fly fishing that I had no clue about. He definitely needs to come out and spend some time outside of Bend fishing, perhaps with me as well! entice her parents with the idea of coming back for a week next summer to stay in the beautiful vacation community. We even got to see some deer hanging out in some back yards. I’m an alcoholic but I really just like showing off the variety of tasty Oregon beers). I had a ciaopino which was fantastic and everyone else enjoyed their meals as well. again I think Emily’s mom was nervous about the heights and her dad once again surprised at the lack of guard rails! It was cold so we didn’t stay long. signs at the Rex T. Barber memorial located there which I had never done before. The guy was pretty cool and even flew his plane under the bridges which was amazing because it didn’t look like there was much room to do so. From there we all headed up to check out the town of Sisters, OR where we walked around for a little while and checked out the shopes. Emily especially liked the homemade olive store and her mom was able to pick up some Oregon berry jams to take home. 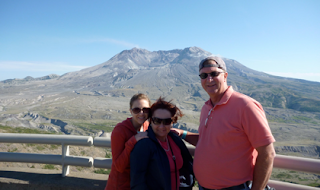 We grabbed some quick food in town and then headed over the scenic McKenzie Pass to show her parents the extensive lava fields up there from the Dee Wright Observatory, as well as the amazing views of all the surrounding Cascade volcanoes. We spent some time up in the windy pass taking photos and checking out all the views. I showed them the various volcanoes I had climbed and the ones that Emily and I were planning to climb in the few remaining weeks of fall good weather. We drove down the twisty Highway 126 from the pass and stopped at Sahalie Falls on the McKenzie River. The falls are fed by water from the volcanic rocks of the high cascades year round so the flow really never changes and it was just as beautiful now in September as it was in the late spring. Emily and I had done earlier in the summer. This was to be our last stop of our adventure with her parents. I think both of them would like to visit again but next time it will probably be to rent a vacation home in Sunriver for a week or so to do activities around Bend such as fly fishing. Emily and I think that is a great idea. Hopefully her brothers will be able to come then too. We said our goodbyes and handed out hugs and wished them a safe flight. Em and I really think they had a wonderful time and we certainly made sure that they saw the major attractions of Oregon while here!